I know, everyone says that. It’s probably a pretty universally held desire. Somewhere hidden in the secret recesses of our cerebral cortex, many of us believe a manuscript waits to be discovered. I don’t remember ever thinking otherwise. But it wasn’t until my parents passed away and my husband moved me to his dream house on fourteen wooded acres in Grass Valley California that the real opportunity to write presented itself. Our new home was a magical place with a Grandma Moses view out my kitchen windows. Most of the time I loved it there. On the downside, it was more than half a state away from my children, grandchildren and friends. And then, menopause hit like a tsunami. That was my state of mind in the middle of our second summer in our dream house—2005. I had already redecorated the kitchen and landscaped the yard. I was miserable and badly in need of another diversion. One day I stood in my beautiful office and stared out the window praying, certain that God was never going to hear me again. My eyes lit on the gray house down the hill, a house where we had seen lights but never any people. I sat at my computer and started typing. Words began to flow out. After the first paragraph, I knew I was writing a mystery. It was marvelous therapy, and kept my mind well occupied, but I never knew where it was going. I poured all my complaining and misery into that story. Sometimes, the main character (who oddly enough happened to be just like me) would impulsively do something she shouldn’t. Horrified, I’d delete that scene and say, “She can’t break into someone’s house.” Or whatever she had done. But she’d insist. “I must. How am I going to find what I need to find if I don’t?” So I’d rewrite the scene. I really got into the story, discussing possibilities with my in-laws whenever we visited. They encouraged me to continue. My mother-in-law asked me to write her into the story. Her name, Zora Jane, seemed perfect for the protagonist’s best friend and mentor. Throughout the initial writing phase, real life intruded in many ways. For example, my husband burned a pile of oak leaves and garden debris in a blaze that lasted for days. Watching the fire, I knew that had to go in the story. One day after I’d completed the first draft—called “Cornerstone House” in those days—I mentioned to my friend at Bible study that I had written a book but didn’t know what to do with it. She suggested taking it to the Mount Hermon Christian Writers conference. That proved to be one of the best pieces of advice I ever received because at Mount Hermon, the desire for excellence was born. 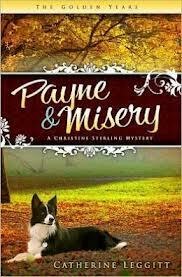 Payne & Misery, as it is now named, had to be rewritten seven times during a ten-year period before it got whittled down to the kind of story that could get published. In its present state, it may not be perfect, but it has come a long way from its miserable beginnings.